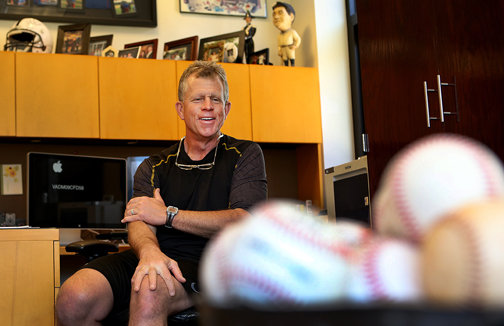 For a baseball coach – one of the best in the business – Tim Corbin owes much of his career to influences from a different athletic endeavor. “I love the sport; I’m attracted to those guys as people,” Corbin says, as he reflects on the connections to football that have led him from his New Hampshire home through playing days in Ohio, through coaching stops in South Carolina, and to a dugout perch on Nashville’s West End. From that vantage point last year, he watched his Vanderbilt Commodores win the school’s first national championship in a men’s sport. The success he’s had on the diamond, though, began to take shape on the gridiron, on the hardwood and on the ice back in his hometown. “I was an organizer as a young person, even with hockey,” he recalls. “I remember in our neighborhood I made up teams and put people on teams and organized. At 10, 11 (years old), we had a pond in the backyard. My dad built a little ‘Zamboni’, filled it up with water. We’d put a coat of water over the ice so we’d have fresh ice all the time. That industrious nature and those leadership traits were in play early and often, according to Jack Corbin, Tim’s father. “Even playing in little league, 10 years old his first year, the catcher got injured,” Jack remembers. “Seeing him go back there and direct things, I thought, he’s going to be a coach some day. “He played a lot of baseball – catcher, infield. They pitched him constantly in high school – not that he started games, but he’d always wind up going in. They threw his arm out. “He couldn’t play football at first, because of his knees. When he played, he played linebacker. He was all-conference. He played basketball. He’d take his first shot, and if he missed, he wouldn’t take another one. Growing up in New England, Corbin says he had little choice – and plenty of inspiration. “Because of talk radio and the Red Sox being so prominent and the Patriots and the Celtics and the Bruins being so prominent, it’s just – that’s all I ever wanted to do was be around sports and be in sports,” Corbin says. After high school, and a year of prep school – “which is big up North,’’ he explains, Corbin wound up at Ohio Wesleyan, a Division III college located just north of Columbus. Corbin played at Ohio Wesleyan for Kevin Colbert, who doubled as baseball coach and football assistant. Last fall marked Colbert’s 15th season with the NFL’s Pittsburgh Steelers and his fifth as the franchise’s general manager. Once his playing career ended at Ohio Wesleyan, a stint as a graduate assistant coach at Ohio State ended abruptly and unexpectedly. Out of desperation, Corbin took a leap of faith that came through in a big way. 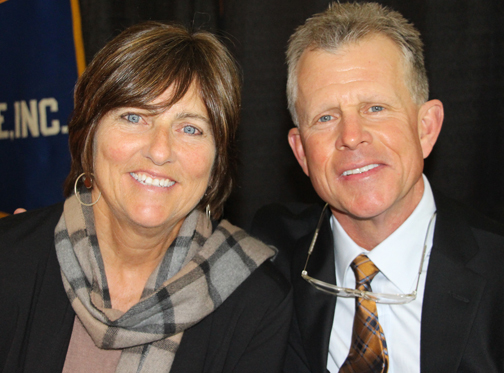 Tim Corbin and his wife Maggie at the March 23 meeting of Nashville’s downtown Kiwanas Club, where Corbin was recognized as 2014 Nashvillian of the Year. At the advisor’s suggestion, Corbin landed in Spartanburg, S.C. – home of Wofford College and then-athletic director Danny Morrison. “I didn’t call or anything; I just went down there. I figured I’d get on his doorstep and ask if I could work,” Corbin says. Morrison, now president of the NFL’s Carolina Panthers, set Corbin up as a volunteer coach initially and eventually got him into a paid position. And when the time was right, Morrison endorsed him to revive the program at Presbyterian College, just down the road in 1988. Then an NAIA school, Corbin led the program’s transition to NCAA Division II and won 106 games in six years while earning postseason berths in each of his final three seasons. With the progress, he put himself on the radar at the Division I level. Fellow New Englander Jack Leggett added Corbin to his staff when he took over at Clemson for the 1994 season. Leggett, who coached previously at Vermont and Western Carolina, hired Corbin at the recommendation of a mutual acquaintance. Maggie Corbin was married to Presbyterian basketball coach Greg Blatt when Blatt and Corbin were both at the school. The Blatt’s went on to Western Carolina, where Greg was head coach for four years. In their first year together at Clemson, Leggett and Corbin won 57 games – the second-most in school history – and three years after that, Corbin and Maggie were married, so the venture proved successful on both fronts. “I was intimidated a little bit. They had this great program and I remember my first recruiting trip, leaving Clemson and listening to talk radio and someone saying they couldn’t believe they hired this NAIA coach to do their recruiting. So I’m thinking, they think I can’t do it, and I don’t know if I can. Duly motivated, Clemson reached the NCAA Tournament in each of Corbin’s nine seasons on the coaching staff, making four College World Series appearances and with two other Super Regional berths and winning 50 or more games on five different occasions. After the 2002 season, Corbin initially considered a return to the head coaching ranks, but ultimately chose not to take the position at Fresno State. Shortly thereafter, another of his gridiron contacts came through. “That side of the country to me is way, way, way away,” he said of the West Coast. “This side of the country to me just felt right. I either wanted to be in the Northeast or the Southeast. “It was a tough decision, but I went back to Jack and said, ‘I’m going to stay here’. Sisk, an ex-strength and conditioning coach at Clemson, took a similar position with the Commodores following the hiring of former Tigers player and defensive coordinator Bobby Johnson at the end of the 2001 season. “He kinda fell in love with it here immediately,” explains Chris Lee, publisher of VandySports.com and host of College Sports Report on WNSR-FM (95.9). “Some of it was by random chance. He’s a Red Sox fan, and he walks in here and the first thing he sees is the ‘Green Monster’ in left field. But as he sunk his teeth in, he liked the fact that he can recruit good kids that appreciate the opportunity here. A year later, they all loved him back. After going six consecutive seasons without an appearance in the Southeastern Conference Tournament, Corbin led the Commodores to a berth in the eight-team event following a dramatic three-game sweep of visiting Tennessee in the final weekend of the regular season. “Back then, our goal was to go to Birmingham (the tournament was and is held in Hoover, Alabama, a Birmingham suburb),” Corbin says. “That was all we wanted to do. We talked in the first team meeting, and our goal was to celebrate on the field the final game of the year, and we did. Even in their two-and-out tourney appearance, Corbin knew the tone was being set. “I saw potential in the school,” he adds. “I thought the school could attract the right (recruit). I saw Stanford. Pat Murphy and Paul Mainieri had done really good jobs at Notre Dame. “Wayne Graham had done such a good job at Rice. I thought a lot of ‘academic’ schools were doing well at baseball – keeping guys from the draft, holding onto guys for four years because of the academic side of things. Taking that ‘different’ and turning it into a positive keyed a rise that saw Vanderbilt advance to an NCAA Super Regional in Corbin’s second year, then return to that level in 2010 and in three of the following four seasons, with the program’s first College World Series appearance in 2011. “He likes a challenge,” Jack Corbin says. “He found a challenge here. He figured there was no place to go but up. But while athletic success at Vanderbilt has been relatively rare, and often fleeting, other schools – both in the SEC and nationally – were taking notice of the Commodores’ climb. “But by the same token, when four or five places come after your coach, you know you’ve got a good coach. “It’s something we have to deal with. I think what we’ve tried to do is create the environment in the program that he’ll want to be here. For Vanderbilt, fending off schools with traditions like Louisiana State’s, or resources like Oregon’s, hasn’t always been an easy task. “Those jobs offered things that this one (didn’t),” Lee explains. “His thing was, ‘do I regret the fact that my life is going to end one day and I’ll wonder if I could have taken kids to a title at one of those jobs whereas maybe I couldn’t here?’ “But I think he started weighing the priorities and the relationships he had here, and that was obviously pretty secondary. 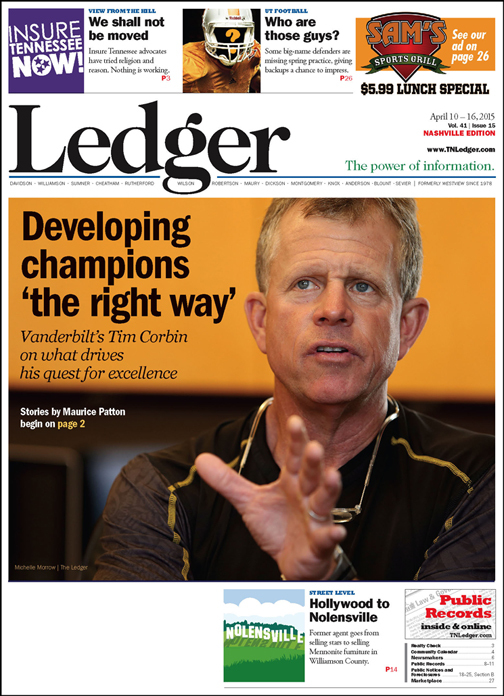 “To be truthful, the thought of those programs was very enticing at the time because Vanderbilt wasn’t ‘Vanderbilt’ in my way of thinking at that time,” Corbin says. “So there were opportunities and resources that weren’t available here, but they became available because of those opportunities. “It was probably tiresome for Vanderbilt. 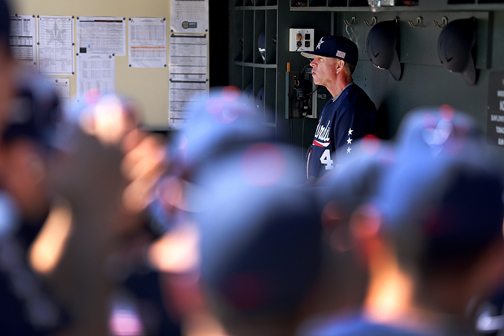 Here’s the baseball coach looking at this job, this job, this job. In staying put, Corbin has endeared himself to the community through his blue-collar work ethic, his commitment and his genuine nature. “There’s nothing fake about him,” says sophomore outfielder and former Brentwood standout Bryan Reynolds. “He wants everybody to reach their full potential, and he’s willing to do whatever he can for every player, on or off the field. That connection helps explain the outpouring of support shown for Corbin when the Commodores completed their successful title run last summer. “He had 700-something (congratulatory) text messages, maybe close to a thousand,” Lee says. “I understand why. When they went to Omaha [for the College World Series] in 2011, and I’d been covering them since 2004, I had a text from him on my phone that said ‘thanks for all you do; you’ve been with us all the way’. “In our business, a lot of people win championships and a lot of people you root for to win championships because that’s the sort of person you want to be a winner and have success. Tim’s one of those people,” Williams explains. In typical Corbin fashion, though, he views the program’s success as something he has been able to give to its supporters. “For them to view an athletic team [being] successful at the very end – I’m happy for people who have invested more time than I have into the university, people that have spent tons of money to watch these kids play at this university for long periods of time. I’ve only been here 13 years. “I feel like a parent. You’re providing a situation for everyone and watching everyone have fun with it. “I watch my dad, the fact he’s alive to see this. I know it means something to him because he’s probably grinding mentally for his kid. “To see the relief for him and my mom and Maggie and my brother, that to me is rewarding.